Active Ingredients: 200 g/l (16.5% w/w) mecoprop-p, 200 g/l (16.5% w/w) MCPA and 25 g/l (2.0% w/w) dicamba. Headland Relay P is a powerful selective herbicide for control of annual, biennial and perennial weeds in grass leys and permanent pasture. It offers the flexibility of programmed spraying regimes covering both spring and autumn treatments. However Headland Relay P should not be used where clovers or other legumes form an important part of the sward. 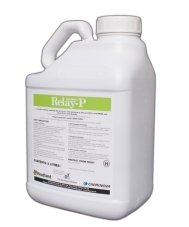 A selective herbicide for control or broad-leaved weeds in agricultural grassland. For use by certified professionals.